Welcome to the little old house with tatami! “Okasan’s house” is a small old wooden house with traditional Japanese flooring tatami. It was built in 1940s by two women named Ms.Isayama and Ms.Oka. Ms.Isayama started piano and English class in this house. During that time Ms.Oka worked in Ministry of Foreign Affairs. 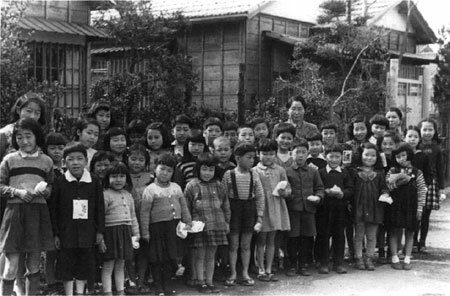 After her retirement, Ms.Oka helped Ms.Isayama with her classes. Lots of children around the neighborhood came to this house and the house was always filled with music and joy. At 2007, Ms.Oka has passed away. At her lifetime, she wanted this house to be a place for people around the area. Her wish was inherited to her grand niece Ms.Koike. With the support from lots of people, Ms.Koike arranged this place to be a gathering place for children to young and elderly people around Setagaya.